I'm Here. I'm Queer. What the Hell do I read? : The Idea That Ghandi Was Bisexual Got This Book Banned... But Shouldn't It Be A Cause To Celebrate, Instead? The Idea That Ghandi Was Bisexual Got This Book Banned... But Shouldn't It Be A Cause To Celebrate, Instead? I didn't know that Ghandi, while he was a lawyer in South Africa, left his wife to live with a guy in Johannesburg. The guy was Hermann Kallenbach, a German-Jewish architect. 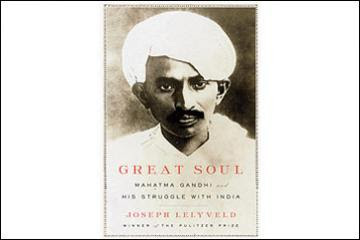 Pulitzer Prize–winning author Joseph Lelyveld writes in his biography of Ghandi, “Great Soul: Mahatma Gandhi and His Struggle With India,"
“... 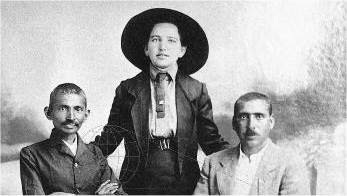 It was no secret then, or later, that Gandhi, leaving his wife behind, had gone to live with a man." Check out this article in the New York Times about the uproar going on in India about this book and how it is being banned. 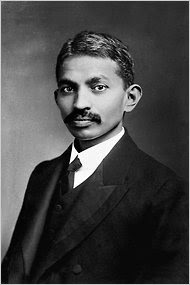 ""Great Soul" also obligingly gives readers more than enough information to discern that he [Ghandi] was a sexual weirdo, a political incompetent and a fanatical faddist—one who was often downright cruel to those around him"
Evidently, the whole idea of this idol of civil disobedience, peaceful protest, and India's transformation into an independent nation being in any way queer is so disturbing that rather than read and discuss the lingering homophobia in the culture, the powers that be would rather ban the book and keep the "dangerous" information away from the public. "India’s law minister, M. Veerappa Moily, said on Tuesday that “the book denigrates the national pride and leadership,” which he said could not be tolerated. Officials “will consider prohibiting the book,” he added." "I think my discussion of Gandhi's letters to Kallenbach â€” which have been in the public domain for nearly 20 years â€” shows very clearly that Gandhi had a deep love for his Jewish friend and wanted him by his side for the rest of his life. He says as much." Ghandi loving a man makes me kind of ridiculously happy. Ghandi's first name was Mohandas. seated on the right is Hermann Kallenbach. The picture is from 1913. Mohandas and Hermann, a lawyer and architect, living together in the largest city of South Africa, and... in love. Ghandi's always been one of my heroes. And now I discover, he's a queer one. The reaction to this saddens me on two levels. First, I can't believe some people cannot reconcile his accomplishments with his sexuality. Why should one be allowed to diminish the other? Second, I can't help but wonder how history might have taken a different course if Ghandi had been 'outed' during his lifetime. Considering the reaction today, I fear it would have tarnished him to the point where his ideas would have been rejected, rather than embraced. Hi Sally - thanks for your comment. Yes, it also makes me think about how history might be different if Ghandi had been open and proud of all of who he was... If we were taught that he was queer in school, and that maybe his being queer was part of what gave him the insights and strength to change the world the way he did... The idea that being GLBTQ is a gift is still revolutionary, but perhaps by being REAL about history, and with people coming out and being real today, we can change that. Oh computer, you did not just destroy my ridiculously long comment on this post. Curses. 1) As far as I can tell, you have not actually read this book, and the allegations that Gandhi was gay come only from the reviewers and not the author, who, in fact, denies them. I have not read this book either, but from what I have gathered here, I would still hesitate to jump to the conclusion that Gandhi was romantically involved with a guy just because they really really liked each other. And lived together for a while. Okay, yes, it is questionable, but sometimes that sort of thing happens. It is along the same lines as the double standard applied to men and women: granted, in those days two women living together would probably also be questionable, but even today, two straight women can walk down the street holding hands without anyone really questioning it, but if two guys do the same, they must be gay, because only a gay man would do something so unmanly. Hand-holding does not equal romance; nor does cohabitation. Though granted, if Lelyveld really didn’t think the two men were lovers, why, in the quote you provided, would he juxtapose Gandhi’s relationship with Kallenbach with Gandhi’s wife? Also, it might help if we had the faintest idea if Kallenbach were possibly gay or anything. 2) Sorry to rain on your pride parade, but…you really want to celebrate that Gandhi, while away from his wife for many years, started getting it on with some guy? If it were a girl, we would consider it a major social unacceptability, and I don’t see why it should be any different with a guy. I’m pretty sure that bisexuals do not like implications that they need multiple partners at the same time or are incapable of sustaining a fidelious relationship. In any case, whether Lelyveld intended it or not (presumeabley not), it seems that this book is being marketed as celebrity dirt. Which is not good because, a) gay is not dirt (though cheating on a wife probably counts), and b) so many things I don’t know where to begin, but essentially boiling down to: why do you care? This is freaking Gandhi who liberated India and basically founded the concept of peaceful protest that is still being used all around the world a hundred of years later. You don’t think maybe we should focus on that? But no, people want their soap-operettic dramas. Though I do agree with the idea that schools should not ignore the fact that certain historical persons were queer, and not just bring it up in high school to make the class giggle. Oh, and "Mahatma" is a title roughly analogous to the Christian "Saint," and it is perfectly legitimate to call Gandhi by it. Yay Wikipedia!